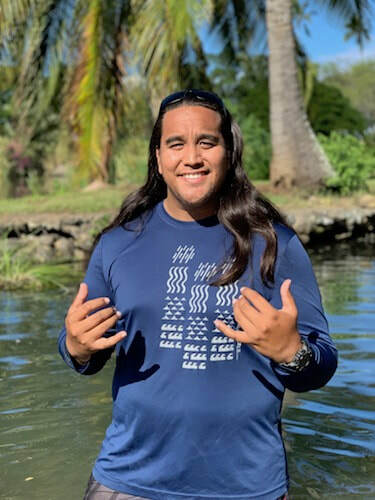 Raised in both Kaimukī and Mililani, Oʻahu, Makua is a graduate of Kamehameha Schools Kapālama, and is continuing his education at the University of Hawaiʻi at Mānoa for a Bachelors in Hawaiian Studies and Psychology. He is humbled and appreciative of his past work experience with ʻāina and the people who have worked along side him. Connecting to places like Ka Papa Loʻi ʻO Kānewai from his childhood, and Paepae ʻO Heʻeia for the last year, his journey as a haumāna of the land and sea has been a series of growing experiences and fruitful knowledge. Makua plans to take some of that ʻike kūpuna and apply it to Loko Eaʻs agricultural side in helping to reopen and recultivate a loʻi site that rests on the edge of the fishpond. His hobbies include music, being outside, and smiling.